When the water is calling, celebrate the sun and surf with the Seafolly Kids Summer Essentials Frill Tube Tank One-Piece. One-piece in a solid design with a shell-embroidered, scalloped fringe at the neckline. Narrow, adjustable shoulder straps. Fixed tie at the keyhole back. Full rear coverage. 82 percent polyester, 18 percent elastane Lining: 90 percent polyester, 10 percent elastane. Hand wash and line dry. Imported. Measurements: One Piece Length: 20 in Product measurements were taken using size 6 (Little Kids). Please note that measurements may vary by size. If you~re not fully satisfied with your purchase, you are welcome to return any unworn and unwashed items with tags intact and original packaging included. Conquer the waves with chic style and sheer determination in the Summer Essentials Short Sleeve Surf Tank One-Piece! One-piece surf suit features mesh detailing at sleeves and sides. Stretch fabrication for a wide range of motion. Round neckline. Short raglan sleeves. Zip-closure at back. Center back seam. Moderate rear coverage. 82 percent polyester, 18 percent elastane. Machine wash cold, tumble dry. Made in the U.S.A. and imported. Measurements: One Piece Length: 20 in Product measurements were taken using size 6 (Little Kids). Please note that measurements may vary by size. If you~re not fully satisfied with your purchase, you are welcome to return any unworn and unwashed items with tags intact and original packaging included. Surf out with confidence and hit the waves with focus in the Summer Essentials High Neck Tank One-Piece! One-piece surf suit features a charming mesh design at front chest and straps with a circular cutout at back. Stretch fabrication for ease of movement. Pull-on construction. Fixed shoulder straps with clasp-closure at back. Scoop neckline and back. Moderate rear coverage. 82 percent polyester, 18 percent elastane. Machine wash, tumble dry. Made in the U.S.A. and Imported. Measurements: One Piece Length: 22 in Product measurements were taken using size 10 (Big Kids). Please note that measurements may vary by size. If you~re not fully satisfied with your purchase, you are welcome to return any unworn and unwashed items with tags intact and original packaging included. Get away from the tame poolsides and manicured beaches with the wild surf chic of the Seafolly Kids Jungle Geo Reversible Tank One-Piece. Reversible one-piece swimsuit switches between a floral-overlayed geometric print and a solid face. Swim fabric: &amp#8226 Lightweight swim fabric in a blend of poly and xtra life elastane. &amp#8226 xtra life elastane provides chlorine-resistant, abrasion-resistant protection to extend the life of the swimsuit. &amp#8226 Hydrophobic synthetic fibers provide quick-dry performance. &amp#8226 Stretch blend with high recovery to maintain fit. Scoop neck. Adjustable shoulder straps with a laced, cross-back keyhole at back. Sleeveless. Full rear coverage. Fully lined. Body: 80 percent polyester, 20 percent elastane Lining: 82 percent polyester, 18 percent elastane. Machine wash and dry flat. Imported. Measurements: One Piece Length: 24 in Product measurements were taken using size 8 (Big Kids). Please note that measurements may vary by size. If you~re not fully satisfied with your purchase, you are welcome to return any unworn and unwashed items with tags intact and original packaging included. 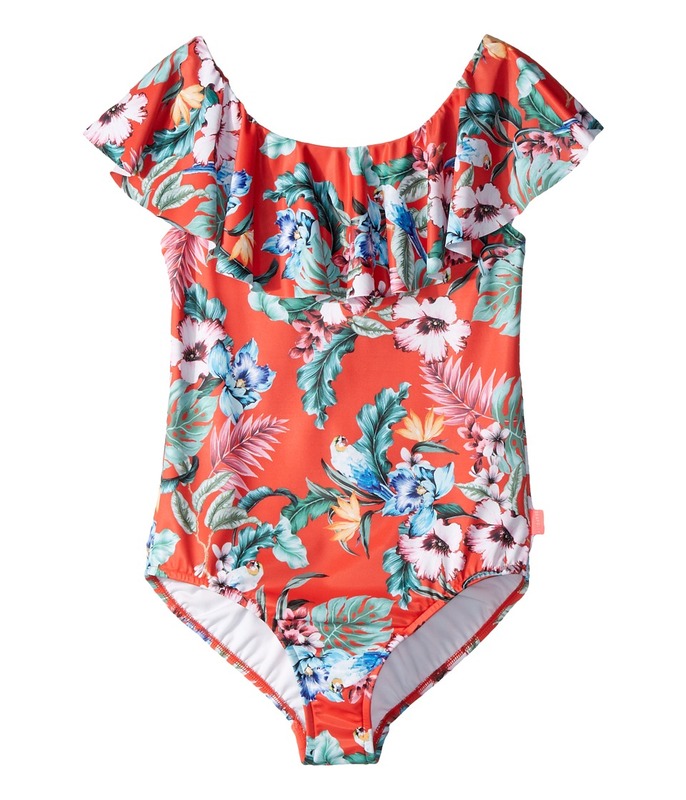 Enjoy the tropical side of surf heaven in the Seafolly Kids Jungle Paradise Ruffle Tank One-Piece. One-piece swimsuit features an allover print in a vibrantly hued, allover floral print. Swim fabric: &amp#8226 Lightweight swim fabric in a blend of poly and xtra life elastane. &amp#8226 xtra life elastane provides chlorine-resistant, abrasion-resistant protection to extend the life of the swimsuit. &amp#8226 Hydrophobic synthetic fibers provide quick-dry performance. &amp#8226 Stretch blend with high recovery to maintain fit. Flutter detail swings from sleeve through the neckline. Scoop neck and back. Full rear coverage. Fully lined. Logo patch placed at the left hip. Body: 80 percent polyester, 20 percent elastane Lining: 90 percent polyester, 10 percent elastane. Machine wash and tumble dry. Imported. Measurements: One Piece Length: 25 in Product measurements were taken using size 12 (Big Kids). Please note that measurements may vary by size. If you~re not fully satisfied with your purchase, you are welcome to return any unworn and unwashed items with tags intact and original packaging included. Have fun splashing in the waves in this cute Forget Me Not Long Sleeve Surf Tank. 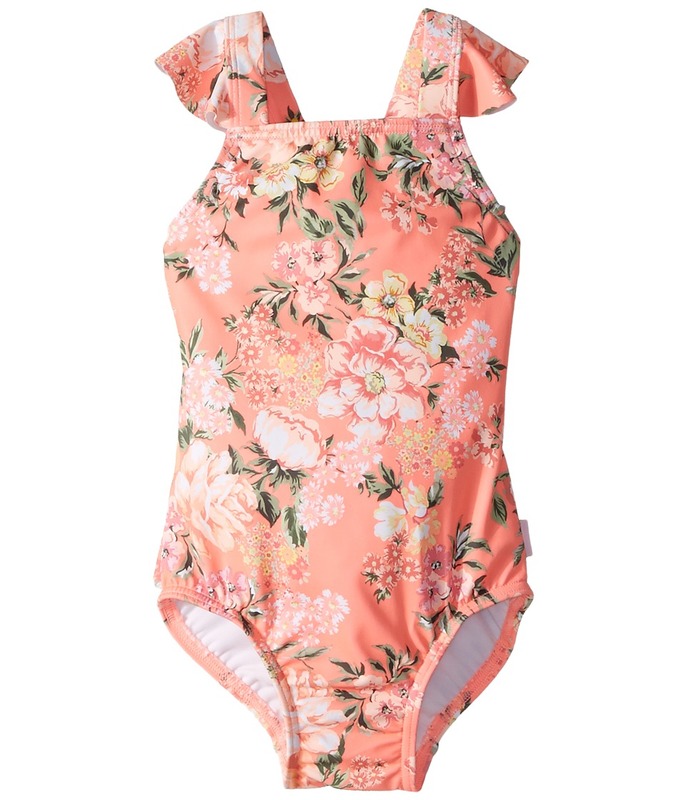 One-piece swimsuit features an allover floral print. Swim fabric: &amp#8226 Lightweight swim fabric in a blend of poly and xtra life elastane. &amp#8226 xtra life elastane provides chlorine-resistant, abrasion-resistant protection to extend the life of the swimsuit. &amp#8226 Hydrophobic synthetic fibers provide quick-dry performance. &amp#8226 Stretch blend with high recovery to maintain fit. Mock neck. Half-zip front closure. Long raglan sleeves. Ruffled sides. Full rear coverage. Fully lined. 80 percent polyester, 20 percent elastane. Lining: 90 percent polyester, 10 percent elastane. Machine wash and hang dry. Imported. Measurements: One Piece Length: 17 in Product measurements were taken using size 2 (Toddler). Please note that measurements may vary by size. If you~re not fully satisfied with your purchase, you are welcome to return any unworn and unwashed items with tags intact and original packaging included. Hop into the pool and float through the afternoon in this beautiful Forget Me Not Ruffle Tank One-Piece. 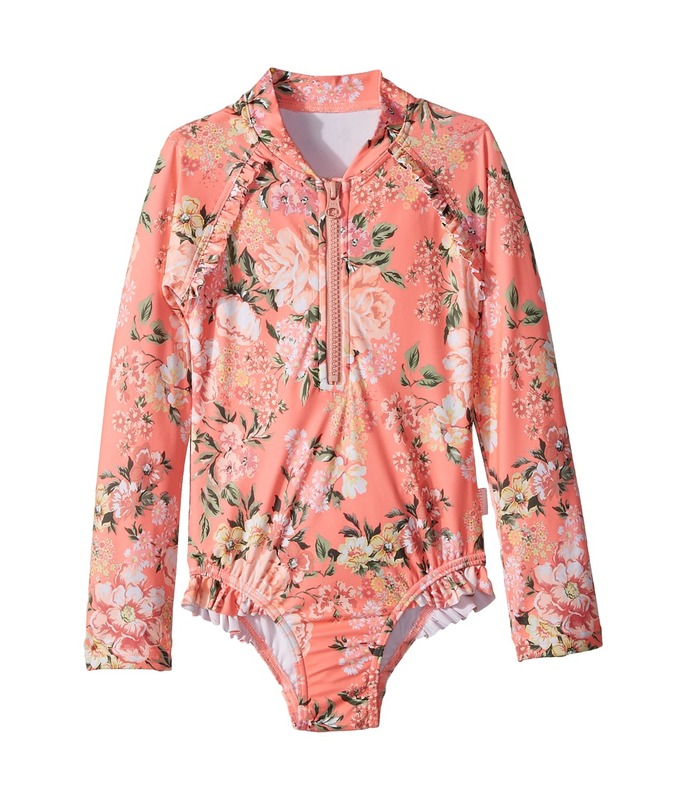 One-piece swimsuit features an allover floral print. Swim fabric: &amp#8226 Lightweight swim fabric in a blend of poly and xtra life elastane. &amp#8226 xtra life elastane provides chlorine-resistant, abrasion-resistant protection to extend the life of the swimsuit. &amp#8226 Hydrophobic synthetic fibers provide quick-dry performance. &amp#8226 Stretch blend with high recovery to maintain fit. Square neckline. Wide, crisscross straps. Ruffled accents along straps and rear. Full rear coverage. Fully lined. 80 percent polyester, 20 percent elastane. Lining: 90 percent polyester, 10 percent elastane. Machine wash and tumble dry. Imported. Measurements: One Piece Length: 15 1 2 in Product measurements were taken using size 0 (12-18 Months). Please note that measurements may vary by size. If you~re not fully satisfied with your purchase, you are welcome to return any unworn and unwashed items with tags intact and original packaging included. When the water is calling, celebrate the sun and surf with the Seafolly Kids Summer Essentials Tri Kini Set. Bikini set in a solid design with decorative, patterned lace panels. Top: Triangle bikini top features backed lace panels at the cups. Narrow, adjustable shoulder straps. Hook clasp at the center back. Lined through the cups. Bottoms: Bikini bottom in a solid silhouette. Stretch waistband. Full rear coverage. 82 percent polyester, 18 percent elastane. Lining: 90 percent polyester, 10 percent elastane. Hand wash and line dry. Imported. Measurements: Length: 5 in Front Rise: 8 1 2 in Back Rise: 6 in Product measurements were taken using size 8 (Big Kids). Please note that measurements may vary by size. If you~re not fully satisfied with your purchase, you are welcome to return any unworn and unwashed items with tags intact and original packaging included. When the water is calling, celebrate the sun and surf with the Seafolly Kids Summer Essentials Apron Tankini Set. Tankini set in a solid design with decorative, patterned lace panels. Top: Tankini top features a cropped silhouette. High neckline with open lace panel. Narrow shoulder straps meet at a V-back. Lined through the cups. Bottoms: Bikini bottom with backed lace panels at the sides. Stretch waistband. Full rear coverage. 82 percent polyester, 18 percent elastane. Hand wash and line dry. Imported. Measurements: Length: 9 in Front Rise: 7 1 2 in Back Rise: 7 1 2 in Product measurements were taken using size 8 (Big Kids). Please note that measurements may vary by size. If you~re not fully satisfied with your purchase, you are welcome to return any unworn and unwashed items with tags intact and original packaging included.